Brace yourselves, travel introspection ahead. Does everyone who goes to Hawaii come back and feel the need to write something in this vein? Here’s Bourdain on Hawaii too, much more succinct than me. Flew out of Minneapolis in the midst of one of the most beautiful spring mornings in memory. There was NO line at airport security. A fellow traveller at my gate was wearing a May the 4th Be With You t-shirt. Meaningful, because I was headed to Hawaii to help celebrate friend Carrie’s birthday on May the 4th. My mom sent pictures of her new little barn kittens right before I boarded. I had an exit row to myself on the flight to LAX. I stepped off the plane in Maui & realized I was walking three times faster than everyone else in the airport–a reminder to just slow down already. The drive to the hotel north of Lahaina had no heavy traffic. The hotel had penguins. Penguins. Molting penguin is looking at you! By the time I had been on Maui for a couple of hours, I wondered if this was it–if this charmed beginning would follow me through my entire 8 days in Hawaii. 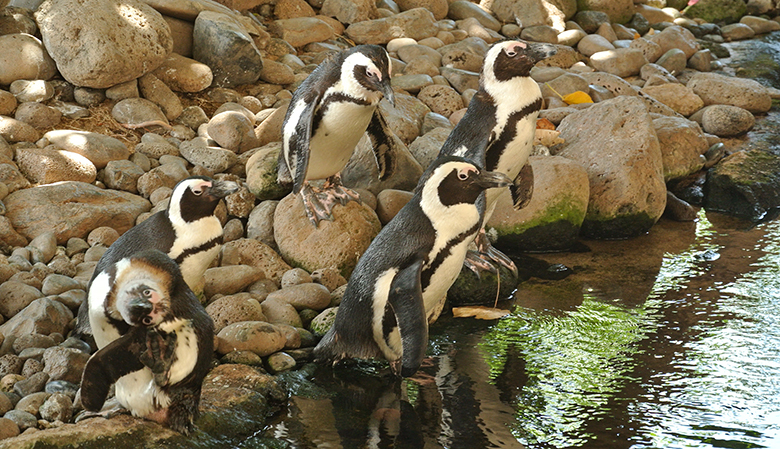 Ease, a relaxed pace, penguins, no deeper thoughts or decisions necessary. Work had already fled my brain. Would work stay out or remain on the periphery, crowding enjoyment? I slept fitfully that first night. Jetlag and the unaccustomed sounds of waves crashing on the beach were my distraction to sleep. At 4:30am I was awake for good, and not even cranky. If you’ve ever been around me when I wake up in the morning, you know this is out of the norm. 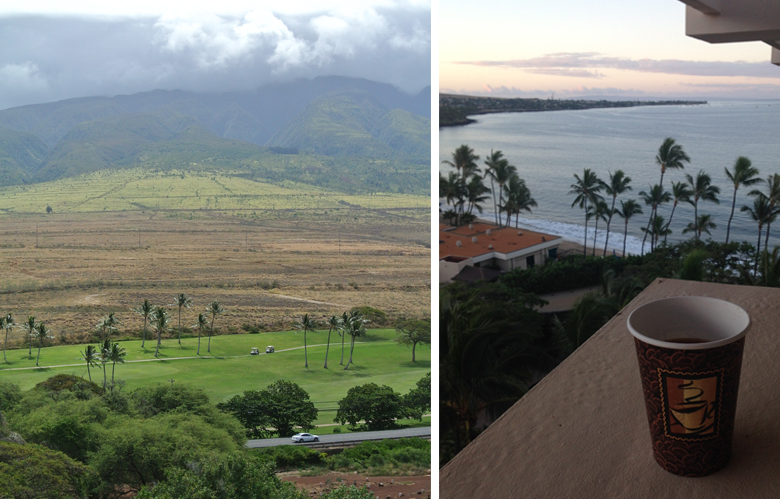 I made coffee, stepped to the lanai, and took in my first daylight views of this place called Hawaii that so many people rave about. People rave about it so much, in fact, it annoyed me to the point of specifically not wanting to visit. I’m not prone to visiting anywhere tropical. I have never enjoyed sitting on a beach in a swimsuit. Tropical locales are too hot, there is too much coconut, sunburns are not fun, and I get really tired of people talking about beaches as the best thing that could possibly ever be ever ever. Instead, more oft I venture to places of snowy mountains or really old cities. Places with thousand-year-old paintings I can read history in. I came to Hawaii this time because I wanted to be far away from what I knew, but not have to work to figure out communication between languages. And not do much if any planning. I didn’t know what to expect, but figured I could always just head to a hillside trailhead if all the people on beaches with shave ice were making me twitchy. But here, gazing at the West Maui Mountains and the Pacific Ocean in one sweeping glance, in an acceptably warm but not hot temperature, Hawaii was almost instantly winning me over. We bided time until the day’s adventure was to start, eventually wandering out to find the pick up location for the Road to Hana tour booked for the day. Somewhere around 6:50 am the 12-person tour van pulled up to the hotel, the driver stepped off the bus and first words out of his mouth to check in the crew for the day was my name, loud and pronounced correctly. Now, my name is not hard to pronounce. It’s said just like it is spelled. But still, this correct & confident pronunciation never happens. There is always hesitation, switching up of syllables, a raised tone at the end signifying the person had no idea if that pronunciation is correct, or worse, a lot of “Daniel” instead of “Danielle.” This time though, it was my name spoken aloud correctly, and by a local. Again with the ease of this place. This day, this person, is what would lay the tone for this trip to Hawaii. Because: this man, our driver, Keoni, is a native of Maui. 46 year old single father of four kids 13-26, and has never left the islands. Not only has he never left, he mentioned to friend Carrie (the girl with the airplane around the world tattoo on her shoulder) that he did not fully understand the desire to travel. This may seem narrow-minded, but I don’t think narrow-mindedness factored in to Keoni’s view of travel or of the world. It’s entirely possible he’s never had a chance to leave the islands or even think about traveling–single parenting in this expensive locale must be very hard to take a vacation from. And why, when you’re already in this beautiful, relaxed place. I don’t understand not wanting to travel, just as he does not understand the desire to. So I ponder, during this day long jaunt and beyond. Keoni told us tales of life in Hawaii as he drove, tales I want to believe. Tales that also seemed a little crazy. Not a surprise, as amongst other tattoos, a prominent one on his neck ready “Krazy.” Sure, he had our 12 lives in his hands for that day on a narrow winding road with precarious drop offs, but you know you’re safe with a person who spells crazy with a “k.” It’s the ones who spell it with a “c” you have to watch out for. (Side note. There is no C in the Hawaiian alphabet, so this rule may not apply. Too late to worry about now though.) His tales were of surfing every morning. Tales of being the troublemaker in class as a youngster, pulling flowers off of trees and squirting the liquid inside at the teacher. Tales of racing on Maui’s curvy roads at night, roads he knew every inch of having grown up on this island. Tales of boar hunting. 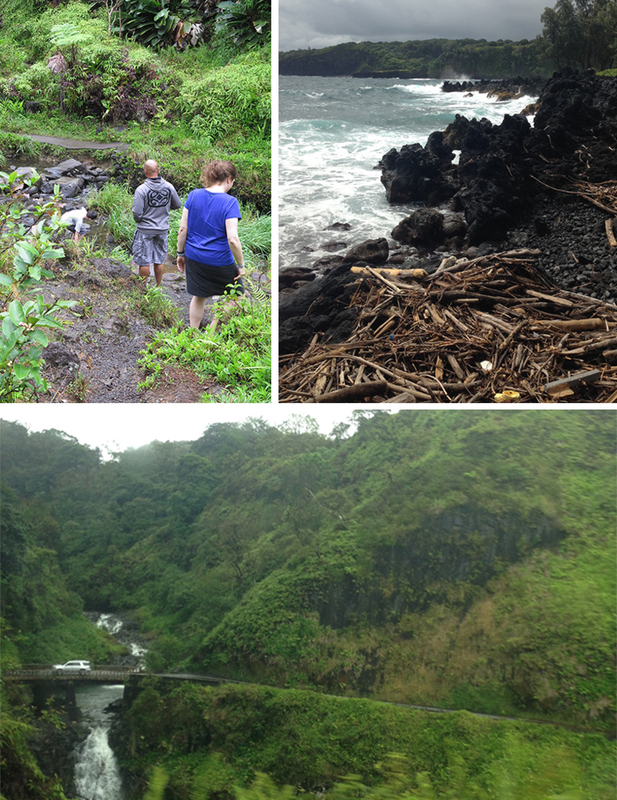 Tales of saving tourists from dangerous waves crashing on sharp lava rocks. Tales of swimming and fishing and feeding sharks the fish out of his fishing bag, knowing the sharks just want the fish and would not hurt him. He also knew everyone we drove past–the hang loose sign was flashed at about every local we passed the entire day. The conclusion I came to is this: Keoni is a part of the island, the island is a part of him. He belongs here. To this land, this air, this water. If you have a sense of belonging to a place so completely, why would you ever need to leave that place? If you left, you’d be lost. There, you know who you are. Top left picture by Carrie. Me headed down a hill, Keoni watching another one of our crew, Matthew, scramble down same hill. Top right, sharp lava rocks & waves. Bottom, part of the Hana Highway. Forgive the photo quality please, I brilliantly forgot my better camera’s memory card at home. Where I live currently and have for 15 years is 10,000 lakes lovely. I have a good life, interesting job, great friends & colleagues, but I’m not rooted to anything in the history or landscape. I was born in Montana, have lived in Nebraska, Iowa, Italy (technically) and Minnesota. My family is in various places elsewhere. Travel has always for me been a chance to see how other people in this world live. To explore & understand more about different cultures. To widen perspectives. To build compassion. To learn. To see the history, and yes also to see pretty things and take pictures and strike a pose to eat lots of food and to escape from everyday life at home. And tell stories of later. Some places I want to go back to constantly, some places I’m perfectly happy not to set foot in again. But always am glad I had the opportunity to see. Maybe I’ve been missing a part though. Maybe the desire to travel is also a person searching for belonging. Wandering the world until they happen upon the place they feel rooted. My view of the world changes in bits all the time–but the part that stays the same is seeing that everywhere, we’re all just humans, trying to get along and navigate life with what we have. Some rural, some urban, some poor, some privileged, educated or not, but we all get up at the start of our day, do some kind of work, sleep, and do it all over again the next day. We’re all just trying to make a life. We just need to find the place where we make sense, where we belong. I was in Hawaii for 8 days. I stepped off the plane & felt calmer. The landscape is more than just beaches–it’s mountains and rainforest and volcano and more. Sitting in the backseat of a van on winding roads wasn’t so great for motion sickness, but worth the scenery. Scrambling down rocks and slipping into a pool was worth it. The arid windy back backside of Haleakala was stunning, as was the lush rocky east side. The coffee was great. At one point I may have even high-fived someone, a bit out of character. 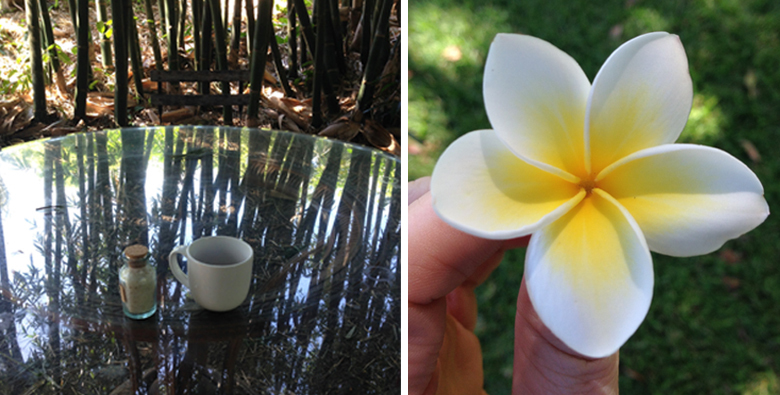 The rattle of bamboo sounded like a midwestern fall, a taste of more varied seasons in Hawaii’s own spectacular way. Waterfalls are beautiful. The cliff divers were fearless, I wanted to join them… well, maybe that’s an adventure I can work up to. But the thing is it seems plausible, not out of reach. I took to this island lifestyle pretty well for being initially uninterested. Even confronting a fear (not a huge fear mind you, but a fear nonetheless) of the ocean. I greeted other runners on two morning jogs, like any runners do anywhere. I talked to all the animals. I was amazed at how sparkly the stars were. I drove winding roads. I hiked. I scrambled up a muddy hillside, further than anyone else on the trail that day who turned back before me, the Kauai mud becoming one with my shoes and socks and legs. I surfed. 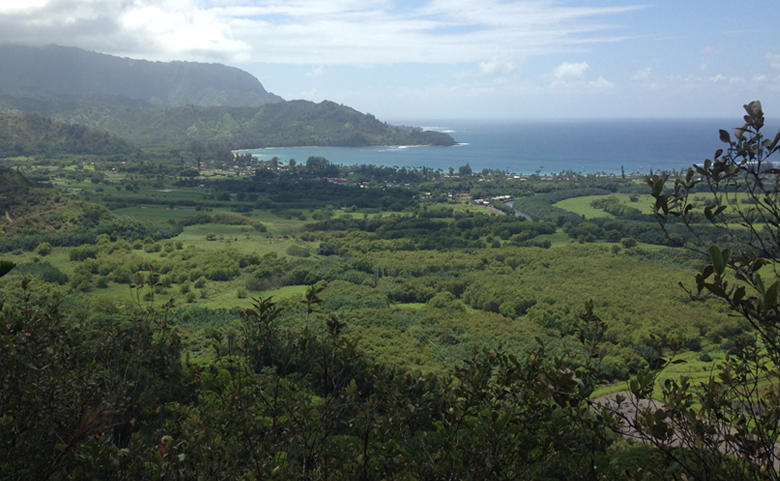 My contacts were swept away in Hanalei Bay–a piece of me left there. I ate the fish tacos, I slurped the fresh fruit smoothies. I took no lava rocks. I cringed at the price of dairy products. Windswept Kaupo, the expanse of Haleakala crater above the clouds, a partial view of Mt. Waialeale through drizzle, halfway up the breezy Pali trail. I waked through towns and visitor locales, watching people interacting with this place. Some loved it, and some were just going through the motions, looking for the next golf course. I had conversations with locals, new transplants, and old transplants. Several locals or longtime residents told me I looked really familiar. Some told tales of why they moved to this place. Reasons of needing change were most prevalent, followed by “it was my dream.” Some people thrive, some people don’t. Everyone I talked to also told me to come back. One woman told me this is her paradise, but perhaps in the most sobering thing I had heard since landing, she also told me “there are jerks everywhere,” as a reminder that nowhere is perfect. There is homelessness. There is unemployment. There is alcoholism. 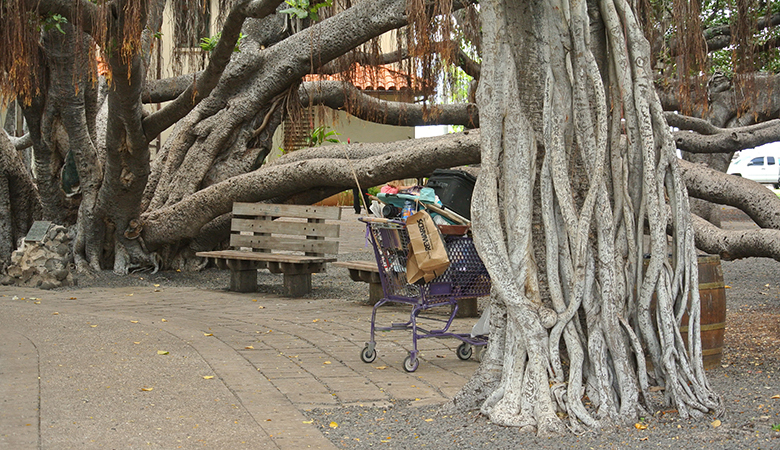 A touch of reality in the banyan tree. I spent a couple of days on Kauai. I stayed in Princeville because I could use a timeshare for free. I did no planning for this island. The timeshare had a concierge on duty, so I stopped in a couple of times to find help making plans for the day. Enter Kai–one of the concierges, and a Kauai native. She has lived all over the world; a gymnast, contortionist, equestrian, botanist, but keeps returning to her beloved Kauai. She lives an adventure lifestyle when not sitting behind a desk as a concierge to pay the bills, helping people like me navigate their way through her island. The stories she tells of surfing with whales & handstands on rocky ledges…I’ll group her into the ranks of “krazy.” She travels, but always returns to Kauai without question. Hope you’re enjoying my contacts, Hanalei Bay. Here in Hawaii I felt good. I felt healthy. I felt happy. I felt decent, comfortable in my own skin. All things that had been noticeably missing in degrees for months preceding this trip. This could be explained away by saying it was from the remaining high of training for & running a 5K a week before travel. You hear it all the time & it’s true, exercise is the worst enemy of anxiety. Or, it could be simply and most logically be because I was actually on vacation after a long stretch of insanely busy time at work and after a gray midwest winter. This happens on vacation–you’re happy & everyone around you is happy, just by the fact that you’re away from real life pressures. There is time to relax and re-engage in relationships with actual humans instead of computer screens and emails. Is this place possibly real life or just suspended happiness, a bubble to reach on vacation, soon to burst. In a tourist economy, people’s jobs are to give tourists the best time they can where they are, and get good tips doing so. The trick is to separate a temporary high from reality of being. I know I enjoyed my time in Hawaii and am almost constantly dreaming up schemes to get back there. Some plausible, some not so much. Daydreaming I am very good at. But. Belonging, on these isolated islands in the middle of the Pacific Ocean? With the krazies like and Kai and Keoni? Where my name is pronounced correctly the first time? In Hawaii I felt settled, for the short time I was there. Do I belong there? Dunno. Maybe I haven’t been to enough places yet.